How To Earn Free Rewards, A Graduation Card and Stampin' Blend News! How To Earn Free Rewards, A Graduation Card and Stampin’ Blend News! 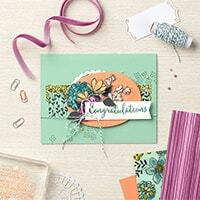 Free Rewards “How To”, A Graduation Card & Stampin’ Blend News! Happy Wednesday, stamping friends! I’d just like to start by saying I love giving to others. Family. Friends. Customers. And I want YOU to be included! So today I’m going to share with you how to earn free rewards from me with every order you place. No matter the size. Plus, I’ve got a fun graduation card made with Host Stamps- a reward earned from Stampin’ Up! Double delight! 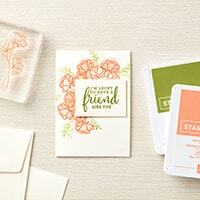 Oh, and Stampin’ Blend news, too! Hang on… we’re covering a lot of ground! Let’s start with Rewards. There’s two ways to earn free rewards with me, so let me break it down: (1) Orders $150 and OVER -or- (2) Orders UNDER $150. Regardless of which camp you’re likely in, I encourage you to read the whole post. There’s a lot of great info. In the Stampin’ Up! world, freebies are called Host Rewards. Aptly named for gifts given to the host of a party (the business model Stampin’ Up! started with -which is still alive and well today- but, no longer the only method, thanks to the world-wide-web.) The important point I want to make is anyone placing an order $150 or more earns Host Rewards. You can be a party of one and qualify! Or here’s an idea: combine orders with your friends to get the most benefits. You can have the party when your happy mail arrives! The above Rewards are from Stampin’ Up! IMPORTANT: Host Stamp Sets can only be purchased with Host Rewards. For example: Hand Delivered can be redeemed for $13 in Host Rewards, leaving you a little extra for something else! Just look at all the options in this set…and sentiments! It’s good for so many occasions. Here’s the fun graduation card I’ve made for my niece, Mikayla. The striped accent is from the Petal Passion Designer Series Paper; envelope flap decor from Pick-A-Pattern DSP- both retiring tomorrow! (Great use for scraps!) Card base is Real Red. The sentiment was stamped with Versamark ink and heat embossed with White Embossing Powder. Don’t forget to use your Embossing Buddy before stamping! Coloring was done with Stampin’ Blend Markers. Clear Wink of Stella glitter makes the balloons shimmer. My favorite part… a place to stash the cash! The little 3″ x 3″ envelopes introduced in last year’s Holiday Catalog are (happily) here to stay. They’re perfect to stash a little gift. They’ll also fit a gift card with the flap left up (use a scrap of Designer Series Paper to decorate the inside of the flap and hide the adhesive)- or just tuck it in. Savvy Tip: Slip a piece of scrap paper inside the envelope before coloring to absorb any bleed-through common with alcohol markers. Are you ready for the news? ALL Stampin’ Blend Markers in current colors are back in stock- available to order NOW! Yippeee! Plus, there’s eleven new colors being added, although these may not be available until mid-June, due to shipping delays. The Stampin’ Blend Markers are HOT, so don’t wait! They sold out very fast before and have been on back-order for months, so there’s likely a pent-up demand that may drain inventory quickly. Here’s my Savvy Coloring Tip of the day: After your coloring’s complete, go around the outer edge with the fine tip end of the Light Pool Party marker (Light Smoky Slate can also work). It’s a subtle effect that creates a soft shadow. I colored a bit heavy on the left side of her outfit so it’d be easier for you to see (it’s so light on camera unless you really look hard!). See it? I post an exclusive Rewards Code every month here on the website. I encourage you to apply it on all orders under $150. On computers, the Rewards Code is found on the right sidebar. On mobile devices, it follows every post. Every time the Code is used, the order totals combine- as if it’s one order! When the total exceeds $150, rewards start to accrue. At the end of the month (typically) I redeem the rewards for free product, which I in turn distribute to each of you who used the Rewards Code. Plus, I pay tax and shipping! Use the Rewards Code> Get Rewarded! That way everyone wins, regardless of the size of your order! Every month is something different. Sometimes a full package of embellishments. Sometimes a sampler pack of several items. I love to surprise you! I hope you enjoyed today’s graduation card and rewards tutorial. I know it’s a lot of info, but I want you to earn all the freebies you can! I’d like to add that whether you use my exclusive Rewards Code or not, you can always expect a handmade thank you card, as well as a greeting card for you to use as inspiration or to gift. It’s my way of saying thank you for choosing me as your demonstrator. I truly appreciate each and every one of you! Reminder: Tomorrow’s the LAST DAY to shop retiring items, as well as the ‘Share What You Love’ Bundles. All orders must be submitted by 10:59pm PST Thursday, May 31, 2018! Have fun! Discounts Up to 50% OFF ! hand delivered, stampin blends. Bookmark. Cute grad cards! Love the cash stash one!